The U.S. Department of Agriculture’s Agricultural Marketing Service (AMS) rescinded the labeling standard for grass-fed meat, which was developed over the course of four years and finalized in 2006 with the support of national farm and consumer organizations. Administrators said the decision was an internal USDA legal decision stating that AMS never had the legal authority to establish the standard in the first place. AMS’s withdrawal of these two marketing claim standards has no impact on an entity's ability to apply to USDA’s Food Safety & Inspection Service (FSIS) for a grass-fed claim on their label. In a call with stakeholders, Dr. Craig Morris, AMS deputy administrator of the livestock, poultry and seed program, explained that AMS verifies marketing claims such as non-genetically engineered/genetically modified (GE/GM) content, responsible use of antibiotics, handling, sustainability and many more. Out of nearly 200 such marketing claims audited by AMS, the grass-fed and naturally raised claims were the only two for which AMS had set a standard. Morris explained that as these marketing claims are becoming more hotly debated – such as non-GMO or sustainability claims – it became evident that with AMS having marketing claim standards for such things as grass-fed and naturally raised, “people were wrongly thinking AMS had standing statutory authority to determine what standards would merit those other, very controversial claims,” he said. Applicants often seek to market the USDA-verified marketing claim on a food product label. To do so for meat products, the company must receive pre-approval from the FSIS, which regulates food labels. Morris said without express authority from Congress, it is not AMS’s role to define standards; that responsibility lies with FSIS. “Because AMS does not have express authority to define grass-fed or naturally raised, it is inappropriate for the agency to offer it as an AMS-defined marketing claim. Instead, companies can use voluntary USDA Certified or USDA­ Verified programs to verify compliance with standards that they develop,” he said. Currently, Congress has given AMS specific authority to develop marketing claim standards for those associated with organic products. Separately, four companies have a USDA Process Verified Program whereby they can evaluate customers against a grass-fed claim and are subsequently audited by AMS. The companies include TechniTrack, LLC of Chandler, Ariz.; Verified Beef LLC of Bozeman, Mont., and IMI Global Inc.
AMS said those companies will need to develop their own new grass-fed requirements, adopt the now-withdrawn AMS standard as their own or point to an existing industry standard. They have until Feb. 11 to identify their new grass-fed standard and update their quality manuals. In 2014, AMS launched the Small and Very Small program to create opportunities for small-scale livestock producers who would like to have their ruminant animals certified as grass fed. This program is designed for producers who market 49 cattle or less each year or lambs produced from 99 ewes or less. Morris said this program will remain intact and participants will need to follow the program procedures which have been updated to include the requirements, instead of referencing the marketing claim standard. 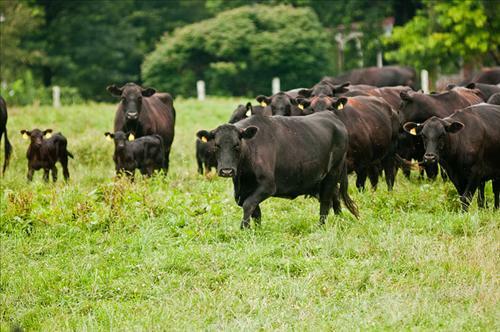 Current users of the program will be issued new certificates that reference they meet the requirements of the SVS Grass Fed Program, QAD Instruction 1020, instead of the Grass (Forage) Fed Standard. AMS is in the process of contacting each SVS participant to answer any questions, but Morris said no action is required on their part. NSAC said instead of throwing out a label standard with widespread support and trust, USDA should insist that AMS and FSIS work together to create and enforce uniform and useful standards. If the justification that AMS does not have the authority to issue the standard is accurate, then FSIS should have adopted and issued the existing AMS standard as its own, simultaneous with AMS’ revocation. The now-revoked standard stated among other things that grass, forbs, and forage needed to be 99% or more of the energy source for the lifetime of a ruminant species after weaning in order to qualify as grass fed. Prior to the setting of that standard, grain fed animals were often sold as grass fed with full USDA approval.